A string of clues, written in an ancient language, points the way to legendary mountain of gold. It's a treasure vast enough to undermine the world's economy, and a mad South American generalissimo will stop at nothing to get it. The only person who can decipher the clues, Dr. Terri Pomfret, is squarely in his crosshairs—until CURE intervenes. Remo and Chiun will have to protect the lissome professor while they follow the trail from one continent to the next, fending off assaults from a rival House that has forgotten its centuries-old treaty with Sinanju. 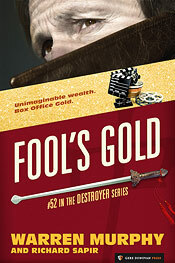 Gold can make fools of most men, but not the Destroyer.